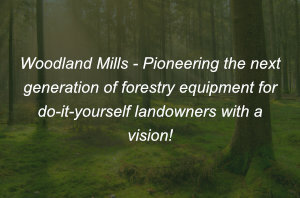 Woodland Mills was co-founded in 2009 by Neil Bramley & Josh Malcolm to fill a void in the industry for high quality, affordable forestry equipment geared specifically for handy, do it yourself landowners with a vision! 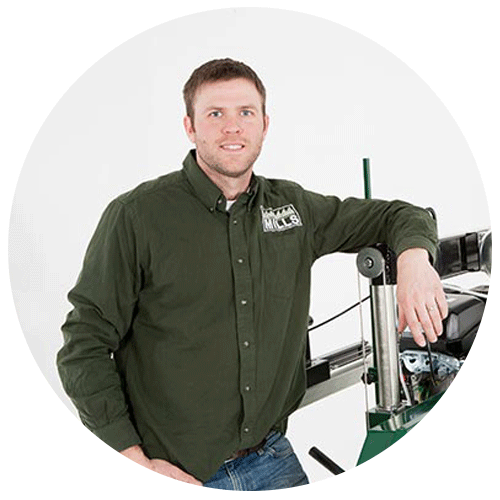 Being mechanical engineers by trade and woodlot owners themselves living in rural North America, Neil and Josh began prototyping designs for forestry equipment in response to the poor selection of these products available in the market. It seemed that everything that was of good quality was extremely expensive and anything at a reasonable price point didn’t have the durability and craftsmanship required to meet the needs of a discerning handyman. Realizing that through a process of innovative design, cost effective manufacturing and selling directly to the customer thereby eliminating middleman markup, they could offer products with the same exceptional performance and construction as much more expensive models but at a price point that hobbyists could justify! With these objectives in mind, Neil and Josh began their quest to design the highest quality, best valued forestry equipment available in the market. As milling enthusiasts, the first product they chose to tackle was a portable sawmill for acreage owners. After many design iterations and extensive field testing a prototype was achieved that offered the perfect balance of durability, portability and precision cutting capabilities. Equipped with a heavy duty frame and the reliable Kohler engine, this mill was designed to last and provide sawyers with many years of milling enjoyment. The next hurdle was to find a manufacturing partner that could consistently deliver the superior quality required to meet Woodland Mills standards, and for a cost that enabled offering these products to consumers at unbeatable price points. Utilizing his years of experience sourcing automotive components for a major North American auto manufacturer, Neil began his global search for the perfect manufacturing partner. After a comprehensive assessment of many potential suppliers, a manufacturer based in China was selected as the best source to meet all the requirements – including state of the art manufacturing equipment, skilled management and workforce, advanced assembly processes and rigorous quality assurance processes. To ensure that every single unit meets our high quality control requirements, the product is fully assembled within the plant for inspection before being partially disassembled for shipping. With a design locked down and manufacturing partner in place, production of Woodland Mills flagship HM126 sawmill commenced in 2010. Since the initial HM126 launch, Woodland Mills has continued designing and innovating a wide selection of forestry products including Wood Chippers, Stump Grinders, ATV trailers, Forestry Winches, Sawmill Trailers and Firewood Processors. By listening to our extremely creative and talented customers, Woodland Mills has continuously strived to make improvements to our existing products and expand our lineup to meet your needs. Staying true to our vision, Woodland Mills has grown to become a global leader in offering well constructed, affordable forestry equipment to do-it-yourself landowners across North America, Europe, Australia, New Zealand, Asia and Africa. To this day, our team of engineers located in Ontario, Canada passionately continue their quest of ensuring that our entire line up of Woodland Mills forestry equipment remain the highest quality, best valued forestry equipment in the industry worldwide! Woodland Mills realizes that engineering exceptional forestry equipment for amazing prices isn’t enough. Where Woodland Mills really shines and what sets us miles above the competition is the phenomenal level of customer and technical support we provide to each of our customers. As you can see from our customer reviews, we make it our mission to ensure that your entire Woodland Mills experience, from the early stages of your product research, to many years after your purchase, we are there to support you in any way we can. So whether you are a hobby woodworker, have some big projects on the horizon or want to earn some extra money, we have the forestry equipment for you! With the most reviews of anybody in the industry, find out why so many people have been extremely happy with selecting Woodland Mills forestry equipment to help them tackle their projects and make their visions a reality! Josh obtained his Mechanical Engineering degree from the University of Western Ontario. Upon graduation, he embarked on a career path that combined his passion for engineering with his strong business acumen gained growing up working for his families retail business. During his downtime, Josh enjoys working on his woodlot as a hobby farmer, and it was there that the desire to mill his own lumber on weekends led to an extensive search for a personal mill. 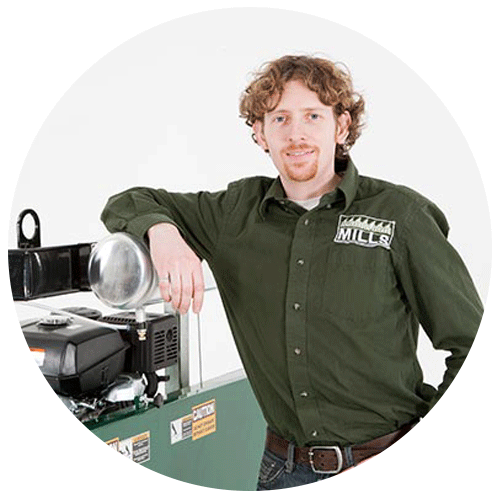 Failing to find such a product, he began prototyping personal sawmill designs with his childhood friend Neil with whom he grew up with (in fact, their days of designing together goes as far back as their adventures of building go-karts at the age of 10 years old). The duo soon realized that there were other like minded property owners with the same needs, and therefore started producing small quantities of these sawmills to sell on Craigslist/Kijiji at prices much more affordable than anything currently available in the market. It didn’t take long for this side venture to ignite an engineering firestorm as the pair recognized a need for well designed, reasonably priced forestry equipment ideal for landowners such as themselves. With this vision, the Woodland Mills partnership was formed. When Josh isn’t wearing his engineering hat or overseeing retail operations, he can often be found in front of the camera where he stars in many of the Woodland Mills product demonstration videos available on the companies website and Woodland Mills YouTube channel. Neil was born just outside of Toronto, Ontario Canada and comes from an entrepreneurial family background. His passion for creating and designing stretches back to his childhood where Neil and Josh were always “frankenstein-ing” homemade go-karts. His curiosity for understanding how things work led to him studying Mechanical Engineering at Durham College in Oshawa, Ontario. It is here where Neil discovered that CAD (computer aided design) was the starting point for design in most industries and the main reason he entered the work force as a Mechanical Designer. Working mostly for General Motors, he dedicated over 15 years in the automotive industry designing various automotive components before moving onto a Project Manager role. This is where Neil began working with various suppliers worldwide and educating himself on global manufacturing best practices. These years of experience in the corporate mechanical engineering field became an incredibly valuable asset as Neil moved into the world of entrepreneurship. Coming full circle from his childhood, he found himself creating again, only this time it was with years of valuable industry knowledge and experience. Living in the country again, now on a 24 acre parcel of land with his wife and two children, the need for certain pieces of forestry equipment presented themselves. It was from these needs in his own life as a property owner, where Neil & Josh’s interests aligned again and where their product ideas continue to originate from. Neil dedicates a lot of his time at Woodland Mills in working with the engineering team to bring these products to life for like-minded property owners all over the world.